Religion has had a major impact on our global society. We would not be where we are without it. In this world, some people cling to religion like a life vest in the middle of the ocean, while others pay little or no attention at all. We cannot deny, however, that it has affected our lives. Religion causes people to do things they might not normally do. Some kill and destroy in the name of religion and others give everything they have to the needy in the name of religion. Either way, we are changed by the things people do in the name of religion. One thing many people seem to argue about, regarding religion, is what is defined as sacred and what is defined as profane. Sociologically, things that are sacred are “elements beyond everyday life that inspire respect, awe, and even fear” (Witt 192). Simply put, things that are sacred need to be taken seriously because they are holy. Sacred things, however, all depend on what religion you adhere to. Praying 5 times a day is sacred to Muslims, but not necessarily to Christians. Bread becomes sacred to Christians when taking communion, but to most people, bread is just bread. Most times, people interact with the sacred through rituals. Rituals are “practices required or expected of members of a faith” (Witt 195). Every religion has numerous rituals for many different things. Christians have the ritual of communion, water baptism, confession, prayer, and many others. Muslims have the ritual of prayer, different holidays, a hajj, and many more, I’m sure. Each group has sacred rituals that, essentially, make up their religion. Each person defines what is sacred to them based on their religious beliefs. Religious beliefs are, “statements to which members of a particular religion adhere” (Witt 194). 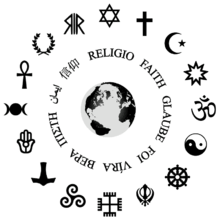 There are hundreds of religions around the world and each one has its own set of widely varying beliefs. Some believe in a God, some believe in no God, some believe in many Gods, and some even believe aliens will come and take us to our next lives. For many people, what religion you are depends on how you grew up as a child. Some religions are very strict about their beliefs. This refers to the term fundamentalism. It’s when people “rigidly adhere to core religious doctrines” (Witt 194). When I think of fundamentalists, I think of the people who never cut their hair and only eat certain things because they take what’s in the Bible literally. In the Bible, women weren’t supposed to cut their hair, so they adhere to that standard because they view it as sacred. It seems like a very legalistic approach to religion, but they only do these things because they believe it is sacred. On the flip side of this coin are things defined as profane. The profane are simply things that are “ordinary and commonplace” (Witt 193). As with things that are sacred, things that are profane vary between religions as well. A menorah might be sacred to Jews, but to others it’s just a fancy candle holder. As we grow up we learn, through our parents, what things are sacred and what things are profane. I think we can apply these words, not only in religion, but in other situations as well. If parents believe than drinking is wrong and show that to their kids, their kids will pick up on that and believe it as well. The parents have, in a way, placed not drinking in the sacred category and told their kids they need to uphold these standards. This is just one example, but there are many different applications for things that are sacred or profane, even if you’re not religious. I grew up in the Pentecostal church, so I understand Christianity better than other religions. In my experience, I’ve found that some things can transform from profane to sacred. For example, I think the order of service has become sacred to the church. No one told us this is the way a service is held; it’s just always been that way. If that, somehow, changes, people will get upset because we are messing with what they believe to be sacred. When you mess with things that are perceived as sacred, you better watch out. People guard what is sacred to them with everything they’ve got and don’t want to give it up. I think the church needs to evaluate what is truly sacred and what is, in actuality, profane. People in the church always seem to be arguing about the carpet color or how to run the nurseries, or something of the sort. Are these really things worth arguing about? Are these things truly sacred to the church, or are they just profane? These are the questions, I believe, the church needs to ask themselves. Not only does the church need to ask these questions, but I think each person, individually, needs to ask these questions. People need to find out what things are truly worth fighting for and what things are inconsequential. Everyone seems to be fighting for every little detail of life, when they should be compromising on the little things and choosing their battles wisely. Don’t waver on what is truly sacred to you, but if something is profane, normal and not holy, allow the possibility that it could be changed. For example, I firmly believe that there is a God and that he loves me. I’m not going to let anyone tell me otherwise. I also believe that Captain Crunch is delicious. Captain Crunch is profane, while my belief in God is sacred to me. Just because I think that cereal is good doesn’t mean I’m going to put it on a pedestal and fight for it. This is a dramatic example, but the concept still applies. Don’t let all the profane things in life become more than they really are. Find for yourself what you truly believe to be sacred and fight for it. Witt, Jon. Soc. Ed. Gina Boedeker. 2011th ed. New York: McGraw Hill, 2011. N. pag. Print.